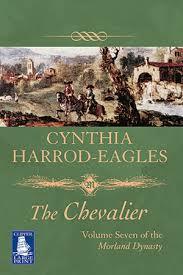 Today's Christmas quote comes from The Chevalier by Cynthia Harrod- Eagles, the seventh book in the Morland series which follows the fortunes of the Morland family through from the days of the Plantagenets through to the 20th century. I liked this passage because I like the idea of being able to watch such a scene unfold. Wouldn't like to be the cook, or live like this all the time, but just once it would be fun! Everything was done in the best of style, and the food was both lavish and elegant. Most of the servants liked and admired India, but the cook positively worshipped her, for under Clovis's direction, during Matt's minority, there had been little scope for his skills. Food at Morland Place had been plentiful, but plain and wholesome, no canvas for a great artist. This Christmas, inspired by India, he excelled himself. The centrepiece of the whole season's feasting was the colossal Twelfth-Night cake, which was three feet in diameter and decorated to be a perfect miniature of Morland Place in beautiful detail, right down to the marzipan peacocks who spread their paper tails on the sugar drawbridge. As well as the feasting, there was of course music and entertainment of all kinds, all the favourite Christmas games and, every night, dancing. India danced with the best of them, and Matt, though he could hardly get a dance himself with his own wife, stood at the side of the room and watched with pride and love as she flew tirelessly up and down the sets, conspicuous in her peacock-blue satin, with the Queen's Emeralds glittering at her throat.